Bang and Olufsen is known for two things: unique design and high prices. Sometimes, the cost isn't so much of an issue if the design is matched by quality audio or a solid display panel. The company's new BeoPlay A6 is a $1,000 wireless speaker with three modes to change its sound based on where it's placed in a room. With Sonos and others already offering similar products for a fraction of the price, I was unsure if B&O's latest product would live up to steep asking price. Unfortunately, my suspicions were correct. To complete the high-end look, the front is covered in a wool fabric developed with the help of textile maker Kvadrat. The company is known for its textile designs and is also based in Denmark, allowing B&O was able to maintain its Danish design, as it were. While you see the included gray option here, there are a few more wool covers in different hues, but they cost extra. 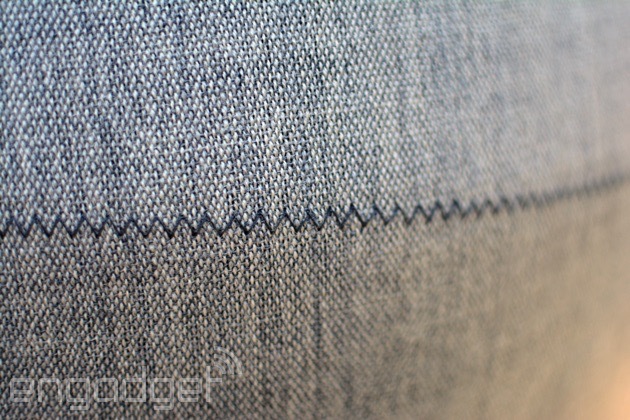 By covering the entire front of the device in wool fabric with a zig-zag stitched line across the middle, B&O created a sophisticated feel that looks high-end. Of course, there's a silver etched logo on the left side as well, so all of your friends know just who made the device. The A6 is also pretty large compared to other wireless speakers, measuring 21.1 inches (536 mm) wide and 11.73 inches (298 mm) tall. It's big. It's huge compared to Sonos' Play:5, and it's significantly larger than several others too, including the Sony SRS-X77. While that may not be a dealbreaker, it will probably factor into your decision, as the A6 requires ample space. Around back is where I started to question B&O's design choices. 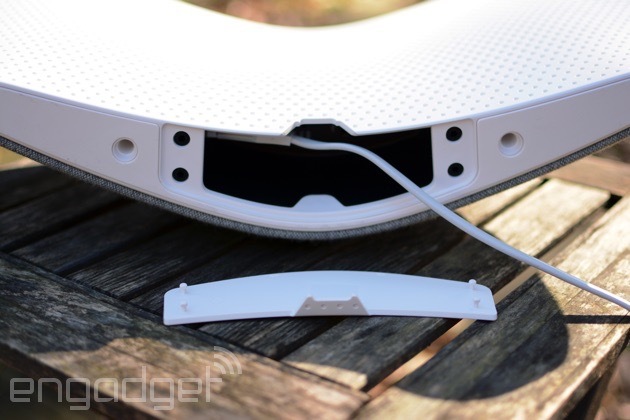 The speaker's backside is made of rather plain-looking white plastic. Sure, there's a molded handle so you can move the unit with ease and a grid of dots punched in for a bit of design flair along with the speaker grille, but it's still standard-looking plastic. B&O says the grille on the back is designed to not only be "pleasing to the eye," but to accommodate the the sound. 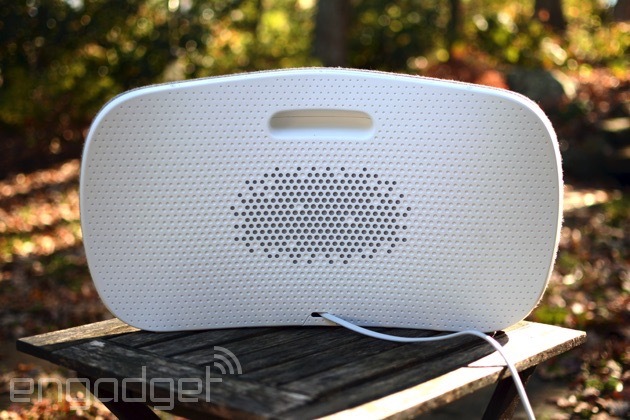 There's also a fifth speaker that faces backwards, hence the need for the grille-like holes on that side. Perhaps I'm being picky here, but if B&O felt that the best sound for the A6 required a rear-facing speaker, I would've preferred for that panel to look a little better. On the top edge of the device, B&O added some nice touch controls that go a long way to redeeming the A6 for me. In addition to power and pairing buttons, there's a touch slider that allows you to swipe a finger or two across the top to adjust volume. You can also tap in the center to mute the speaker (to take a call, for example) or near the power button to skip to the next song. 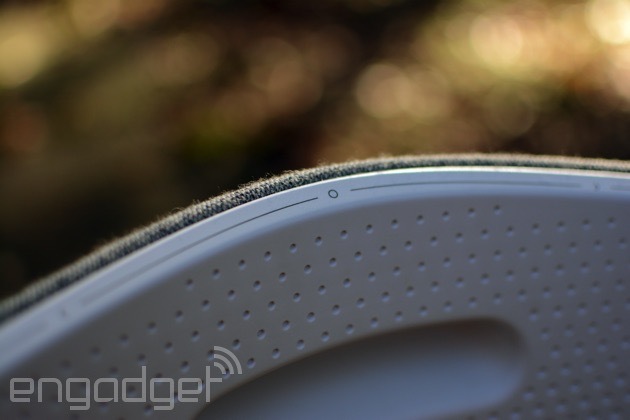 The touch controls are great, but this is hardly the first speaker to offer this feature. Besides, you'll have to leave your chair to use them. In fact, I found myself making adjustments from my phone most of the time. Speaking of phones, B&O's BeoSetup app is where you'll get the A6 connected to your home WiFi. After a couple tries, I was able to pair the speaker and from there, I had music playing as quickly as quickly as I could open Spotify. To play audio from the streaming service, the B&O A6 employs Spotify Connect like other WiFi-enabled audio gadgets. It also lets you play music with AirPlay and Bluetooth if you prefer. Once I got everything up and running, the system ran just fine; the only times I had to reconnect were when I unplugged the device to move it. Additionally, the A6 has an Ethernet jack, so you can skip the WiFi if you'd like. The BeoSetup app is also where you can make adjustments like setting a maximum sound level, a playback time limit and download updates as they become available. Unfortunately, though, you can't make any adjustments to the EQ here. Bummer. Rather than selecting the speaker location modes in the companion app, there's a selector switch beside the power jack at the bottom of the backside. It's also under a removable panel, so if you move the A6 from a bookshelf to a corner, you'll have to remember to manually make the mode change. I suppose if you're not going to move the speaker around much, it's not really an inconvenience, but I could see myself forgetting it's there if I needed to make a change. The A6 has modes for situating the speaker in a corner, on the wall or out in open space. Based on the option you select, the unit adjusts how the speakers perform to offer the best sound for where it's placed in the room. Does it work? I honestly wasn't able to detect a huge difference in sound between the modes. However, I will say that the audio sounds good no matter which of the three locations I chose. The A6 sounds just as good standing by itself, in a corner or up against the wall. And if you ever decide to move it, there's an easy way to get the best sound wherever you put it. In terms of overall audio quality, I found the A6 to be consistent with the sound I've experienced on other B&O products. There's a nice clarity to everything, so when you're listening to bluegrass, for example, you can easily pick out individual instruments and tones. Unlike some of the company's other gear that I've tested, the A6 manages low-end tones well. I did notice a couple hip-hop and electronic songs that have even more bass on other speakers, but overall, the A6 performed admirably across genres. The clarity of sound on the speaker keeps the vocals at the forefront, but makes sure that the highs, mids and lows are all appropriately represented. I'd prefer the vocals to be a bit less prominent, but again, I'm probably being picky. I'd rather have everything blend nicely rather than have one part stand apart from the rest. Despite my issues with some of the material choices B&O made here, the company has built another highly capable speaker. Unfortunately, it's priced too high to be considered by most. When you consider that one of these A6 speakers costs the same as two of the new Sonos Play:5s, the appeal quickly fades. Heck, for $1,000, you could likely put a Sonos Play:1 in each room of your house or apartment (that would be five total). The fact of the matter is, there are simply too many attractive options priced between $200 and $500 for me to recommend the A6. Unless, of course, you just have money burning a hole in your pocket or an affinity for Danish luxury goods. Just know that you can get far more than a single speaker for that sum. The A6 sounds good, and it looks great (at least from the front), but the price is way too steep. 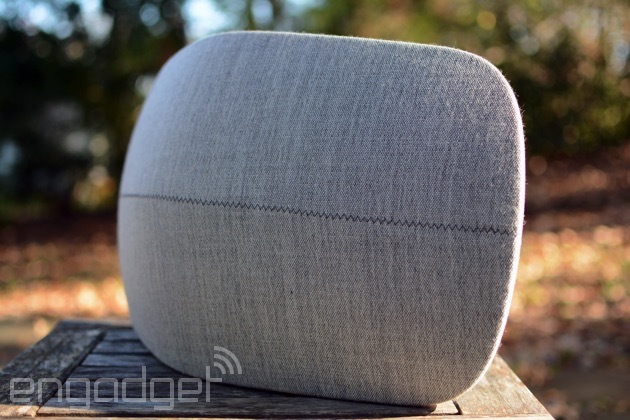 For the money, I'd expect perfection, and while this speaker is good, it's far from flawless.